In this instalment of History Time we’re taking a look at one specific game, EGATrek. 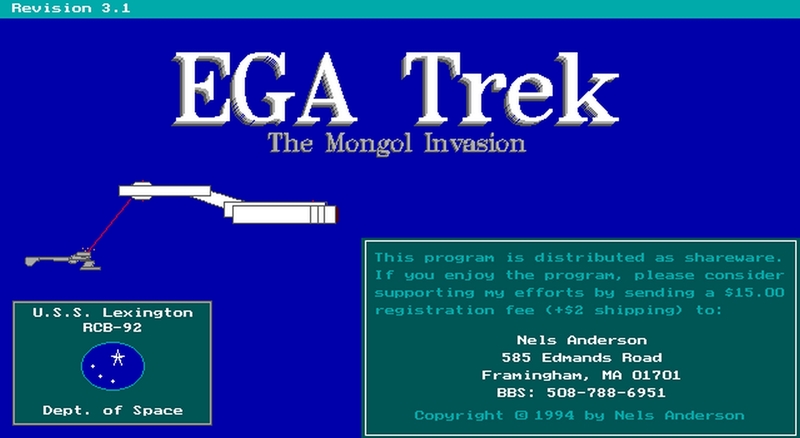 Somewhat in relation to our previous exploration of PLATO first-person games, EGATrek has its roots in the same era with the creator, Nels Anderson, directly attributing the creation of EGATrek to his experience playing Star Trek on college computers in the mid-1970’s. So let’s dive into what the game is before we get to the interview Nels was kind enough to do. 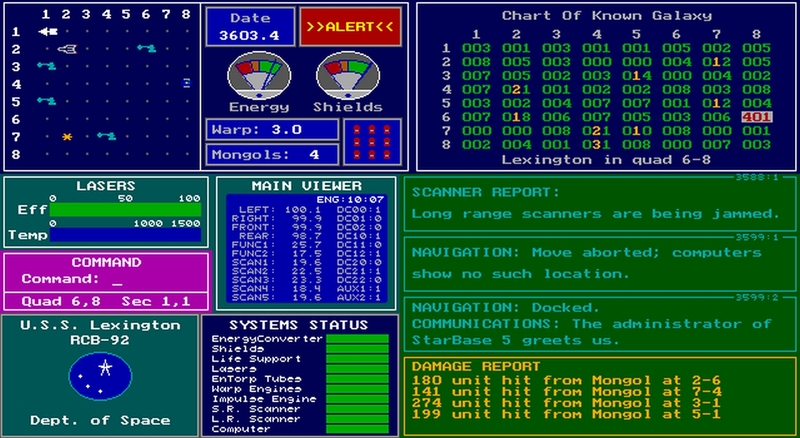 Firstly, EGATrek is my favourite Star Trek game – others have captured the burden of command extremely well, like Bridge Commander but for me the boot up and go nature of EGATrek trumps them all. 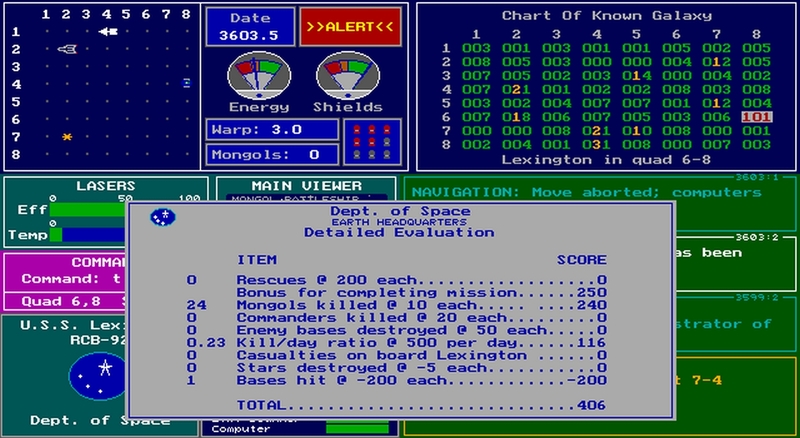 Now we’ve got that out of the way, let’s open up DOSBox and settle into our command chair to get some redshirt widows a nice settlement payment for the wrongful death of their spouses. Oh, wait, the Federation has done away with currency. Uh, I guess we can send them a nice pineapple or a squash maybe. 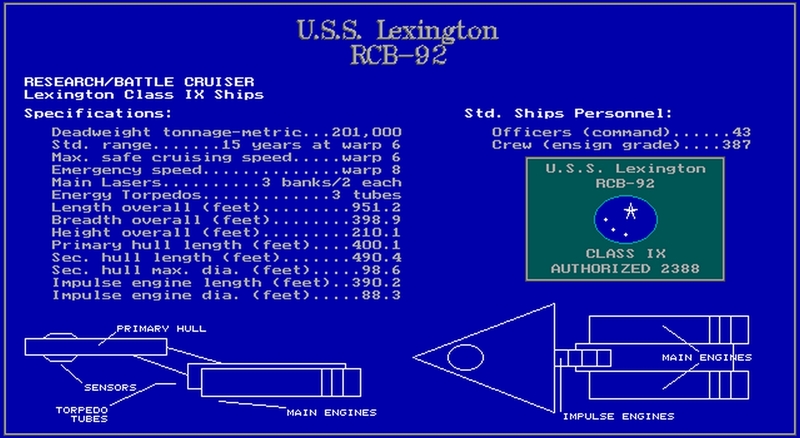 Right away you’re treated to the wonderful title screen with a blocky looking USS Lexington laying into a much smaller vessel like a schoolyard bully. That’s going to be a running theme if you choose the lower difficulty settings. However, for now you’re going to want to move on rather quickly because the title screen also treats you to EGATrek‘s one weak point, the music. It starts out well enough for a game of its era but rapidly becomes grating. Sorry, Nels, I just don’t like it! Hitting any key will take you to your first choice; whether to take part in a briefing or not. Hitting yes will, predictably, take you into a briefing where you learn you’ve been given command of the USS Lexington and are told about the current state of the galaxy – long story short, the Mongols are blowing up Union stuff and it’s your job to head into a 64 quadrant section of the galaxy and blow up every Mongol ship you can find, all other distractions such as rescues are secondary. The briefing will also give you a lovely view of the non-trademark infringing (more on that in the interview below) Lexington and it’s specs. It will then run you through the commands available to you, peppered with enough lore to not feel like a terrible tutorial, which is an art that’s sadly been lost in the past three decades. Nels does a wonderful job of laying out the various basic functions of the vessel and explains the important aspects of the UI, with visual examples and explanations presented for the more complicated chart and status displays. The tutorial, as mentioned, is excellent but doesn't cover everything. Once the briefing is done you’re asked if you want to load a save and, if starting a new game, are given a chance to enter your name, select a difficulty (from 1-5), and set a self-destruct password. That last option is one choice I particularly love, it really sells the nature of being a starship captain when you have to order the self-destruct and then give an authorisation password. Or it would if I didn’t always set mine to “gimps” because I’m more drunk horny Kirk than Picard. With those basic options set you’re thrust into the game proper and left to your own devices. Will you try to save all the Starbases or will you pick one or two as a base of operations and defend those? Perhaps you’ll play it safe, flying at low warp to preserve energy and only inflict minimal wear on your vessel or maybe you’ll slam the engines up to full power and pay frequent visits to the nearest Starbase for repairs. These basic choices pervade the game’s search and destroy gameplay in every aspect. It’s a very pleasant experience to be able to express your own style of command with the handful of variables under your control. It even extends to the combat – lasers are less useful at long range but have infinite ammunition so long as you don’t overheat them. On the other hand, torpedoes have a very limited stock but are devastatingly powerful and can destroy ships with a high degree of certainty at long range. These basic rules lead to a handful of combat strategies; do you rely on your lasers and take an extra hit to close range with a Mongol vessel so you can finish it off without expending a torpedo, or do you just launch a torpedo and save the energy you’d waste taking that hit to the shields? Like any great strategy game you’re constantly asking yourself these questions as you explore but are always laser focused on following your primary objective of killing every Mongol vessel. Even when secondary objectives show up – such as rescuing a Starbase under attack – you’re still taking part in the main goal. Without having to juggle objectives like in many other strategy games you’re free to worry about the command of your vessel. Admittedly, on the easier difficulties this depth doesn’t really shine through. If you set your command level (difficulty) to 1 then battles are massively lopsided in your favour, you’re basically a Borg Cube versus Bambi’s mom. However, if you crank up the difficulty to 3 or higher then the Mongols start to become a threat. As Nels says below, it’s not balanced in the slightest but this is where the game really shines. Slaughter is the order of the day on the lower difficulties. The tactical depth may not be immediately apparent but when you’re several battles deep, with a severely damaged ship and still facing two Mongols in local space the pressure is on. The options start to run through your mind and you consider every option. You’re out of torpedoes, you played it safe in earlier encounters and fired them as a first strike to minimise return fire. You’re low on energy so taking damage is risky. You could drop the shields so the remaining energy can be channelled entirely into the lasers but then your already limping ship is going to take even more of a kicking and may not come out the other side intact. If you run those Mongols may find a friendly Starbase before you return. It’s in these desperate moments that you start to consider your two last resort choices. The death ray and self destruct. Blowing yourself up is never an appealing choice but the death ray provides an option that’s far more palatable to most of us – an experimental weapon that may destroy every enemy ship or may malfunction and blow you up. It’s a gamble that rarely pays off but if you’re anything like me you’ll prefer to go down swinging the biggest weapon in your arsenal. 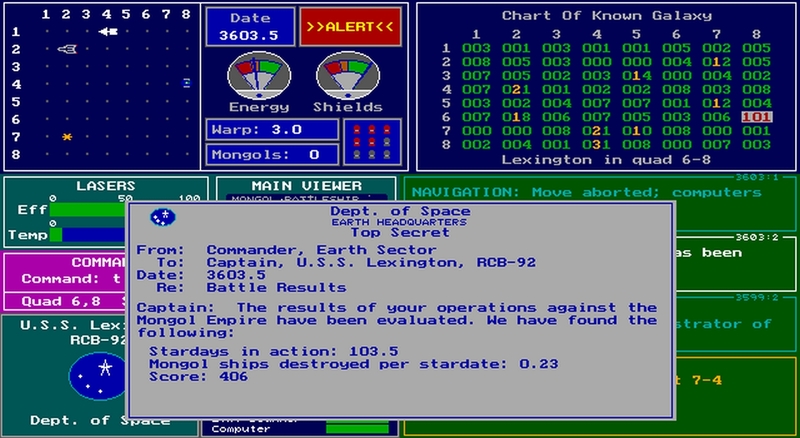 Out of combat your primary concern will be managing your energy reserves, assuming you’re not pushing your warp engines and damaging your ship too, and locating more Mongols to fight. 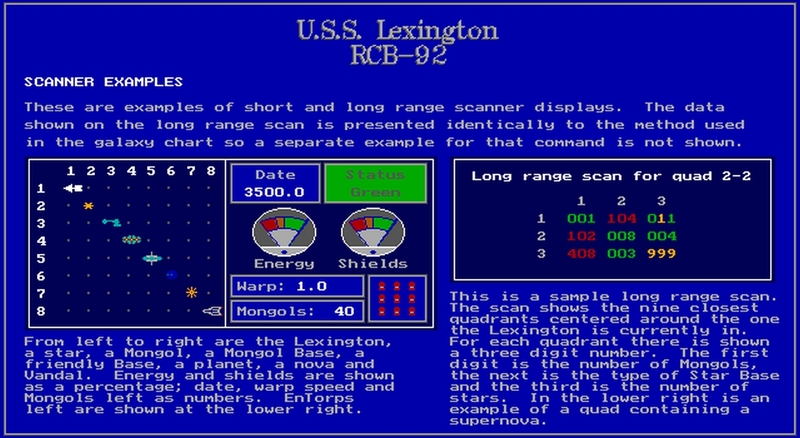 On your long range chart you can see the eight quadrants surrounding the one you’re in with three numbers indicating what it contains; the first digit is the number of Mongol ships, second indicates the type of Starbase present, and the third number shows the number of stars. Additionally, all three numbers showing 9s indicates a supernova and you absolutely don’t want to boldly go into that. The number of Mongols present isn’t the only thing you have to worry about in a quadrant. You might run into black holes which fling you through space uncontrollably. 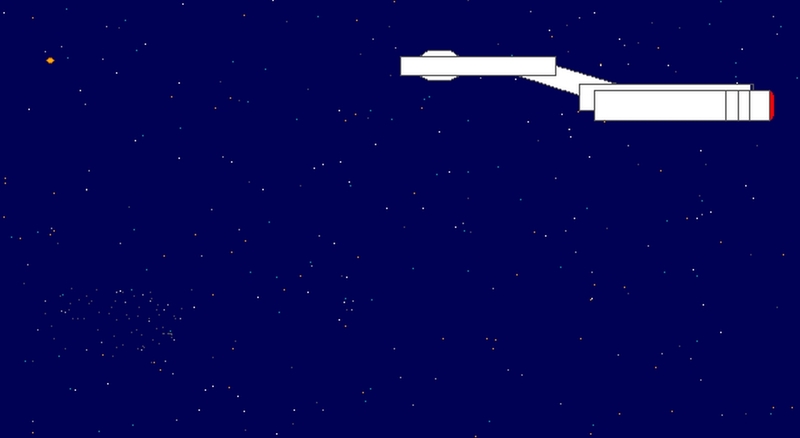 You may also encounter enemy Starbases. The Lexington may be a tough ship but not paying attention to the local space graph can easily lead to you flying into a black hole while trying to engage warp and go to another quadrant. Sometimes you’ll even want to do this deliberately to explore or escape enemies, and again we find that lovely ever-present choice showing up in an aspect of gameplay many other games would have marked as a clear danger. Finishing a game of EGATrek, either by being killed or by killing all the Mongols, will present you with a score screen that breaks down your achievements, and failures, with a numerical value attached to everything so you can be neatly placed on a locally stored scoreboard. 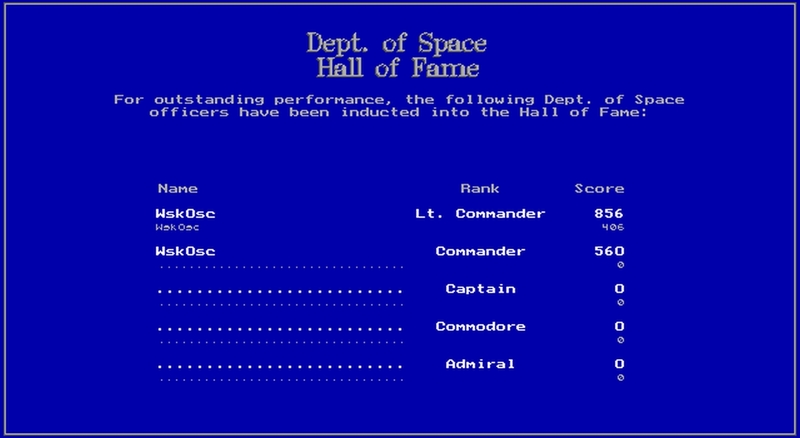 It may not be the flashy ending cutscenes expected of modern games but being presented with the names of your past Captains can reignite your memories of previous runs; remembering the time Captain SpockEars defeated the Mongols in a barely spaceworthy ship, or the time KirksBalls failed miserably in a 3 on 1 engagement is a nice way to cap off a session of EGATrek. That’s enough reminiscing from myself. We’ll cap off this episode of History Time with the interview I mentioned at the start. So, ladies and gentlemen, I present to you the creator of EGATrek himself, Nels Anderson. If you’d like to give EGATrek a go, you can download it from the archive here. Just remember you’ll need DOSBox to run it on a modern machine. Jay: Do you remember what the original inspiration for EGATrek was? Nels: Well that’s easy: it’s based on one of the earliest computer games, “Star Trek”, which I discovered on my college computer system in the middle 1970’s. It was written in Fortran and running on a DECsystem 10 multiuser system that had terminals around the campus. The original game worked on non-graphical terminals, so it just printed everything out line by line and you entered commands. Why a Star Trek fan game instead of, for example, an original setting? Well, the goal was to bring this original game to what were “modern” computers at the time I wrote it, to preserve the game for future players. It’s hard to remember, given how low ago I wrote it, but probably 6 to 12 months working on it part time. Why did you choose DOS? What other choice was there at the time? Windows was not yet a thing. I suppose an Apple II, Amiga, etc. version would have worked but the computer I had access to ran DOS. The early 90’s were basically the wild west of programming and hardware. Was it difficult to program or did you struggle with any aspects of the programming? Either in regards to DOS, the programming language used, or differing hardware configurations? I don’t remember thinking of it as the “wild west”. Things worked different than they do under Windows, but you picked a video mode (I obviously picked EGA) and worked within its limitations. I really don’t recall anything particularly difficult about it. just the historical context their names provide? So, I had to come up with new, non-Star Trek names for the ships and races. I picked names from human cultures that seemed appropriate and ship names from history. Were there any features you wanted to put in the game but couldn’t? Are there any secrets hidden in the game? Can you talk about them? No, I don’t think I put any “easter eggs” into this game. 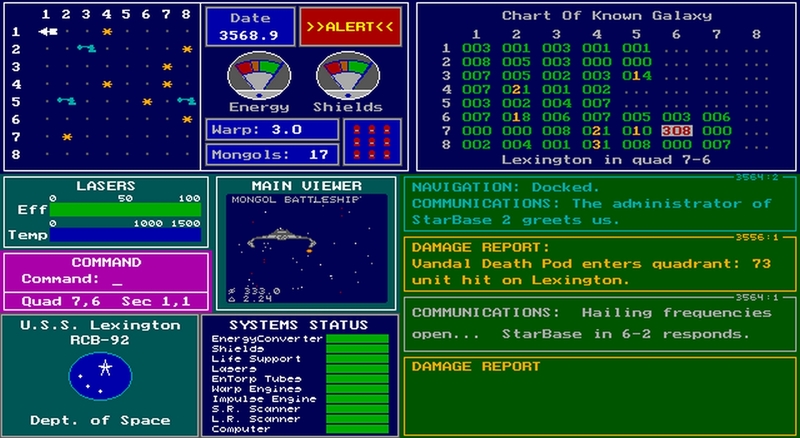 The UI is very sci-fi and incredibly dense for its time. What were the influences and design decisions behind that? 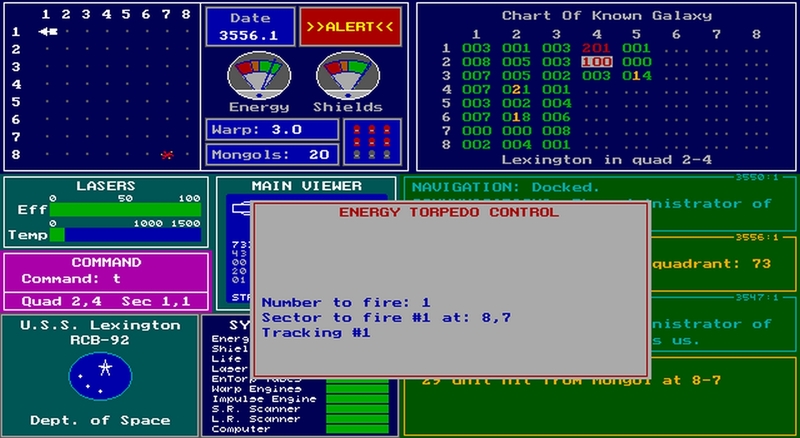 What I wanted to do was take the various displays available in the original text based game and display all of them at once on the screen. So for the most part my displays are like the original text, with a bit of updating to use more graphical elements instead of simple letters and numbers. You have a lot of commands and their abbreviations. Was it difficult to program the text parser? Not that I recall. There’s no AI or anything like that, just a simple and direct mapping of specific commands to specific results. Similarly, was it difficult to have torpedoes navigate the local map to their assigned coordinates? While that’s one of the more complex graphical displays, it’s still pretty straight-forward high school math used to do the calculations of where to display things. Shareware games were a staple of the early 90's computing scene. The self-destruct password is a very cool idea. Was there any inspiration behind that? I really don’t remember. For the most part the play is identical to the original Fortran version though I did add a couple new game elements that I came up with on my own. The death ray reminds me somewhat of the warp feature from Asteroids – was that an influence at all or did that feature come from somewhere else? The inspiration for EGATrek mostly pre-dates video games. The death ray is really more of a logical extension of the other ship weapons in the game. The passage of time plays an important part in the flow of the game, along with the warp speed setting. Was showing the player the stardate intended to put more pressure on them or is there another reason? The use of star dates really ties in with the original TV show, since they always seem to lead off episodes with the star date. You’re right, though, in that putting time pressure on the player is an important part of the game. Being that you’re outnumbered by the enemy, wasting time is a losing strategy. Naturally, difficulty affects the game’s flow a lot. It can be a slaughter on easiest and frantic retreats in a failing ship on hardest. Did you have difficulty balancing the different levels? It’s really up to the individual player as to how much of a challenge they want to take on. The lower difficulty levels could almost be considered more like training missions. Did EGATrek have any infleunce on your life after it was released? Only in that after it was released EGATrek and the other games I wrote generated a good portion of my income for several years until I went on to other things. If by “projects” you mean game projects that’s hard to say. All the games I wrote were enjoyable at the time. The Mah Jongg solitaire game was by far the most popular as shareware and people got really addicted to it, as happens with many solitaire games. Shooting Gallery has the most complex graphics and was quite different to write from any other game I did. Superfly has probably the most creative elements in it (most originality) but was my least successful game. flightsim.com – your site – says it was founded in 1996, 22 years ago, can you tell us anything about that? My games are all DOS based and I was quite comfortable working on that platform. 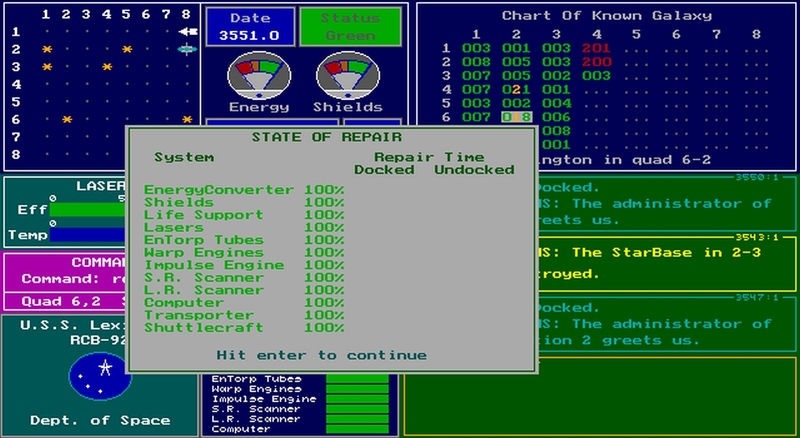 As time went on it became obvious that DOS software was becoming obsolete. 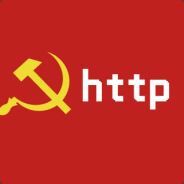 I did convert one game to Windows but found I did not enjoy working on that platform so looked for something else do to. I had long run a phone line BBS system, Xevious BBS, going back to the early 1980’s and with the Internet coming along it was obvious that that was becoming an obsolete technology too. So, I looked for something I could do on the Web and creating a web community based on my interest in aviation and flight simulation was the best choice. So FlightSim.Com went live in the very early days of the web and is still going today, though I find that technology is changing again so I’m probably going to have to find something new to do again before too long. Would you like to tell our readers a little more about flightsim.com? FlightSim.Com is an online community for people with an interest in aviation and computer flight simulators like Microsoft Flight Simulator, X-Plane, Prepar3D, etc. It’s a hobby that many people take very seriously and can be a life-long passion, and it’s also something that real pilots or flight students use for training. I’m a private pilot and have long been interested in aviation, so combining that interest with my interest in online communications starting in the BBS era resulted in the web site.